Let me tell you, I won't generally voluntarily eat a marshmallow. I think they're kind of gross. I might eat just one toasted, I do like the toasted part. I don't actually like s'mores, which I think on Pinterest makes me public enemy number one, lord there are so many s'mores recipes. I do like a) rice krispies treats, and I really like b) marshmallows in hot chocolate. A marshmallow in hot chocolate is really the best. Because it's just the one marshmallow, which is the definition of a treat in my book. But, these! I'm trying to save them for hot chocolate, well, I gave a good amount of them away at practice, actually thinking that folks could go home and have hot chocolate with homemade marshmallows, and people were opening up the little baggies and eating the marshmallows right there, I almost fainted. I forgot that you could do that to a marshmallow. And you know what, they're that good. For the above, I basically followed the recipe for Not Derby Pie's maple cardamom marshmallows, substituting nutmeg as suggested. The maple is really good, I admit, but I think for future batches I will just use corn syrup. Though I also like her suggestion to use gingerbread spice and molasses to make gingerbread marshmallows. I really am making these for hot chocolate, though. And I make really rich hot chocolate, it's kind of a waste of expensive maple syrup. And I'm under no illusion that I can make these healthier by avoiding corn syrup; so for those directions I went back to the source, Smitten Kitchen's Springy Fluffy Marshmallows. I'm going to experiment some more. I saw something out of the corner of my eye about bourbon marshmallows, what. I don't have bourbon, but I have rum. 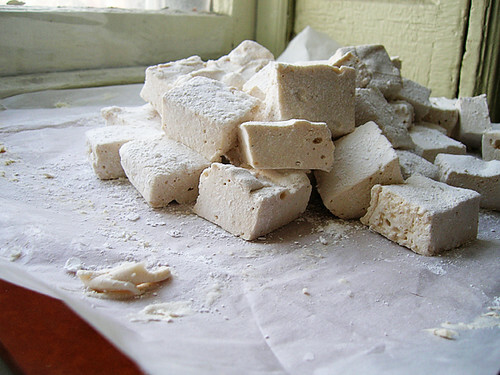 Rum marshmallows. Malort marshmallows? I'm going to be the Johnny Appleseed of marshmallows. Just because it's so cool and surprisingly easy to make them. My personal pro tip is, line the baking pan with parchment and there's no fiddling to get the marshmallow slab out of the pan. It'll just lift right out. And, I use my serrated bread knife to cut the slab into squares. Not Derby Pie says you can use a stand or handheld mixer, but I definitely prefer my stand mixer for beating the syrup and just use my handheld mixer to beat the egg whites. Line a 13 x 9 inch baking pan with parchment paper, butter the paper and dust with powdered sugar. Sprinkle the gelatin over 1/2 cup cold water in the mixer bowl, and set aside to soften. Cook the sugar, corn syrup, the second 1/2 cup of cold water, salt, and nutmeg over low heat, stirring with a wooden spoon until the sugar is dissolved. Increase the heat to medium and boil without stirring until a candy thermometer registers 240 degrees, about eight to ten minutes. Remove from heat and pour the syrup over the gelatin mixture, and stir until the gelatin is dissolved. Beat the syrup on high speed until it turns white, thick, and triples in volume, about six minutes. Meanwhile, beat the egg whites in a medium bowl until they they just barely hold stiff peaks. I use my stick blender with its whisk attachment. Add vanilla, then beat the egg whites into the syrup until just combined. Pour the marshmallow into the baking pan, I used my hands to scrape it all out and smooth it in the pan. "Maybe you should have lubed," Dawn said, who was watching all this. Sift about a quarter cup of powdered sugar evenly on top. Chill uncovered until firm, I put them in the unheated foyer overnight and they were ready when I got out of bed. Actually, they were why I got out of bed. Grab the edges of the paper and lift the marshmallow onto a cutting board. Peel the paper away from the sides and bottom of the marshmallow, then cut the marshmallow with a serrated bread knife into bite size pieces. I cut mine like I do egg bites, which is also where I got the parchment idea from: in thirds lengthwise, then in fourths crosswise, then each piece in quarters. Dust the marshmallows on all sides with more powdered sugar, then put them away in a mason jar or in little ziploc bags for giving away.